Nov 2009 - When my wife and moved to Rainbow, I joined the Southern Pacific (SP) Division of the Toy Train Operating Society (TTOS). They meet every month in Brockhurst, near Anaheim. I started working their booth that they bring to the local train shows. 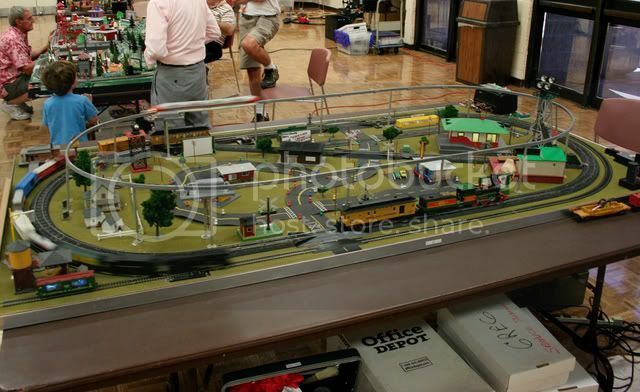 At one of the shows, a member, Rich Haigh, brought a small portable layout. The kids loved it. I was surprised at the attention that it got from the kids. I thought - this was something that I could do. I used O-27 track for its smaller radius. I first built the layout as a small 4' x 4' layout but then I realized that it would not fit in my truck!!! The mountain is just blue foam insulation boards stacked up and spray painted. And there is a piece of foam insulation which covers the bottom of the layout. Track is held down with plastic tie wraps so noise is not conducted to the underlying plywood. Photo taken Dec 2009 in my garage. I took a saw to it and reduced it to 3' x 4' and then it fit in the truck. I had to remove the switch tracks and the sidings. Powered by my original Lionel 1033 transformer which I received in 1950 when I was 2 years old. Photo taken at the layout's debut at the Dec 2009 TTOS-SP meet. It took me a while to find an engine that could stand up to 4-6 hours of continuous running. I found one in the Lionel 8632 from 1997. I installed a #1004 PRR K4 sound unit from Dallee Electronics in the tender to provide chuffing sounds. A typical consist includes a 6473 Horse Transport Car (with bobbing horse heads), a 6465 Lionel Lines Double Dome Tank Car, and a bright red 6059 MSt&L Caboose. Photo taken at the September 2010 TTOS-SP meet in Anaheim. Notice the wheels on the back of the layout. I can tilt it over (after packing up the trains and accessories) and then just roll it around. a 262 Crossing gate and a 151 Semaphore signal. Without a doubt - the whistle was the most popular button!!! Since this was election month, the citizens of Plasticville are attending a political rally. Notice the nice labels on the buttons, a fellow TTOS-SP member, Greg Drusch, made them for me. Photo from November 2010 TTOS-SP meet. 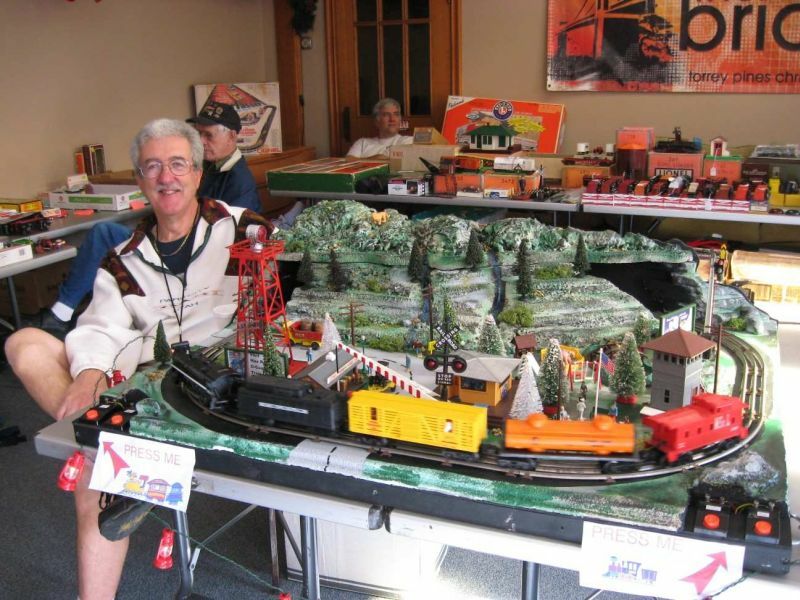 This is a meet of the All-Gauge Toy Train Association which meets monthly in La Jolla. I can just set the engine at a nice slow speed and it will run all day. It has a DC can motor inside with a rectifer so it still runs on AC. I have burned out two smoke units in the engine - just can't keep them filled during these shows. I've added two more buttons for kids to push - I added a 140 Banjo Signal and a 45N Gateman. I had to remove the two Plasticville structures to make room. Photo from Januanry 2011 GTExpo show in Anaheim. Photo from January 2011 GTExpo show in Anaheim. Link to video from the 22 May 2011 TTOS-SP Open House by Steve Eastman. Here is a link to all of the portable layoutsmade by members of TTOS-SP. This photo of Rich Haigh with his portable layout, the TTOS-SP member who got me started with my layout. I'm saddened to report that Rich passed away on 5 Oct 2018. Rich, I'll be reminded of you each time that I setup my little layout. Rich Haigh at the July 2010 GTE show in Anaheim. This story starts years ago (2001). My step-daughter's in-law's were moving to Utah from San Diego. Cleaning out their garage, they uncovered an old Lionel MPC DC set headed up by a 8704. It wasn't in particularly good condition - it was played with! All of their kids were grown and I was the only "kid" around that still played with trains so they gave it to me. Fast forward about 5 years. My step-daughter called. 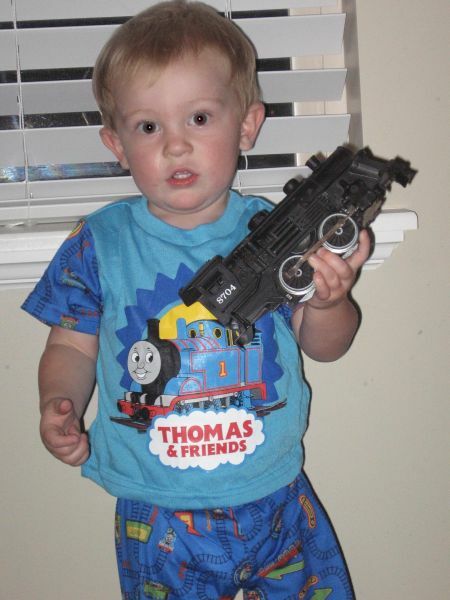 She said that her son, Max, now 2, was getting interested in trains. She had bought him a couple of video tapes with trains and Max really enjoyed them. He would run around the house yelling "Toot-Toot". She asked if I had any any old trains that I could send her for Max. Well I looked at my F-3's, FM's and Hudsons --- I needed a better solution. Then I remembered this MPC set in my closet. I dug it out. An 8704 engine, tender, tank car and caboose. It had a circle of track and transformer. It was perfect for Max. As it turned out, my wife and I were going to visit their family in a month, so I figured we could deliver it in person. I knew that I had to build some sort of platform for it. So I worked in their garage putting together a 3' by 4' frame from 1x2's topped with a piece of fiberboard. Max's sisters were curious what I was doing in their garage. I tried to describe what I was doing but I they didn't understand. I found some green, black and brown spray paint and had at it. I screwed down the track and transformer. Wires ran under the fiberboard. One of Max's sisters, Ashlee, finally figured out what I was doing. After I had the layout painted and the track down, she yelled "Oh, you are building a World!". We went through their toy box and found some buildings, vehicles and people (none to scale). The next day, we showed Max, he was thrilled. At first, he got great fun running the engine full speed around the curves and watching it fly off the track rolling over and over across the room. But now, he has learned that its much more fun to control the speed and watch the train run 'round and 'round the track.